My uncle tells a story from Grandpa's shop: his friends were all making kites so he went to Grandpa and asked for a quarter to buy kite sticks. Grandpa handed him a yardstick and a saw and told him he could save the 25 cents and make his own. Someday I am going to try and rip a kite stick from a yardstick just to see if Uncle Bob was pulling my leg. However I always think of this story when I am faced with a choice of the hard way or the easy way. Recently I had to resaw a piece of 4/4 catalpa that was 8" wide. My bandsaw didn't have enough throat, the table saw couldn't raise up high enough. The "easy way" of temptation was to drive to the KC Woodworkers Guild workshop. They have a nice Grizzly bandsaw set up to resaw up to 19"! But it is a 45-minute drive each way. Using an 8 tpi Disston D-8 to rip an 8" wide catalpa board for shelving. The "hard" way was sitting in the sawtill--a nice old Disston D-8. Full disclosure, I ran the board through the table saw to give me a kerf on both sides. And then I used my own muscles instead of dinosaurs (gasoline) to rip 24" of board. I was done in less than 15 minutes. The story of Uncle Bob's kite sticks is always there to prompt me when I am facing a difficult or onerous task. Do I really need to go buy a new power tool to save effort for one project? (Grandpa--"Save your quarter and just do it yourself"). Should I use the belt sander to remove a 1/4" of wood or should I pull out a handplane? One of the important elements of woodworking and craft is building character and discipline. Part of that discipline is being able to resist the siren call of "the easy way." I have a jack plane from Great-grandpa's toolchest. It is marked "Metallic Plane Co" with two patent dates--1867 and 1869. This tool was designed by Nelson Palmer and was the design that started the Metallic Plane Company in Auburn, NY in 1867. I know this tool was manufactured sometime in the 1870's because the company went out of business in 1880. With little more than a casual glance it quickly becomes apparent that this is not a Stanley. Metallic Plane Co Jack Plane--15" long, 2-1/8" wide iron. From the 1870's. There is no lever cap, lateral adjuster, or depth wheel. There are three confusing toggle levers under the iron and some odd pegs that wedge the chipbreaker down. As I learned more about the features and functions of planes I saw that this 140-year old tool had it all. There is an adjustable throat; a tapered laminated iron almost 1/4" thick at the cutting edge; it has a corrugated sole (subject of the 1869 patent); adjustable depth of cut and lateral adjustment (subjects of the 1867 patent). This was the leading edge of hand tool innovation incorporating the newest concepts to address all the functional needs of planes. Ultimately however Leonard Bailey's approach proved simpler, easier to manufacture, and more robust. So today we have Stanley. There are many lessons to draw from this tool--but the one I am focused on today is innovation. This plane reminds me that there are many ways to accomplish things, creative people are always trying to find a better way to solve a problem. Nelson Palmer identified a need, came up with some interesting solutions, and had the energy to push it to the market. His spirit is alive and well today. Just look at all the interesting gizmos and gadgets at the woodworking shows. Here's to you Nelson Palmer! Nelson Palmer's three-lever adjustment system--a different way to operate a hand plane. It all started when I bought a warming cabinet at an auction. When I picked it up they tossed in two used 2x2's to block it up off the bed of the truck. At home I realized these were pretty nice poplar 2x2's, 8' long, and I just couldn't toss them in the firewood pile. What to do with 16' of 2x2? That sat in the back of my mind until one day I was taking down last year's calendar--aha! Puzzle blocks. Of course you need a box to keep the puzzle in so that led to using some hickory pieces in the lumber pile (that came from another auction), and a sliding lid that came from an old piano soundboard sitting back in the corner (that I have been carting around since high school). Our adopted Grandpa, Mr. Francis, had something he called his "seven-year pile"--things he didn't throw away because they might come in handy sometime in the next seven years. It was a large pile (and in the end a lot of it did turn into scrap) but it was also the source of parts for garden structures, kids toys, and shop fixtures. It was also a constant nudge to imagination--"What can I do with those old 2x2's?" I think we all need to have a 7-year pile of potential projects somewhere. 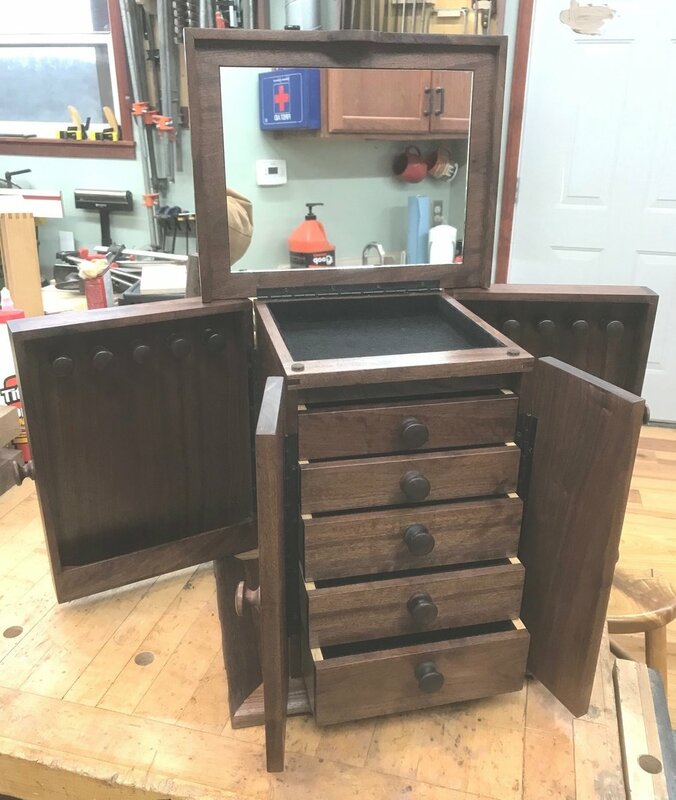 A simple jewelry box can be so much more. This project is actually a statement of love and family values. A replated Stanley #45 plane, Type 12, ca. 1915. Good for another 100 years. Bob and Ken replated their antique planes ... why?